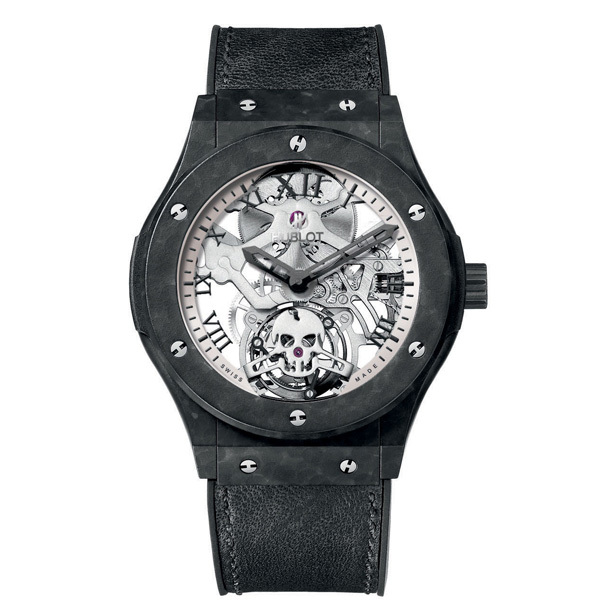 Part of Hublot's skull series, this is a Skeleton tourbillon movement that is far from conventional. Sleek and contemporary, but with a timeless elegance from the traditional watchmaking values used to create one of the kings amongst complications, the ceramic- coated aluminium gives this piece a truly striking appearance. 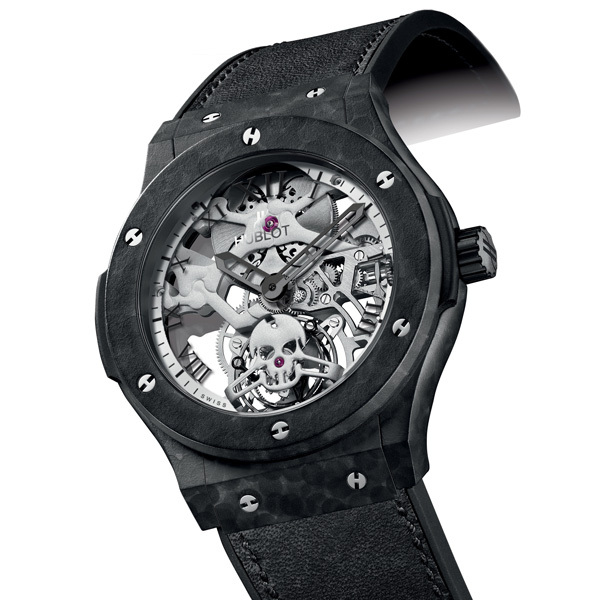 This material, which is new to Hublot, is obtained through a treatment known as MAO (Microarc Oxidation) which consists of a surface conversion through plasma discharge in an electrolyte bath. This forms a ceramic layer which is hard, dense and adhesive. The micro-blasted finish is obtained through manual sanding which gives the case a distressed look and ensures each piece has a unique finish. Finally, this material has a high hardness rating of around 1000 Vickers. It has excellent resistance to corrosion and friction, and is twice as light as ceramic. 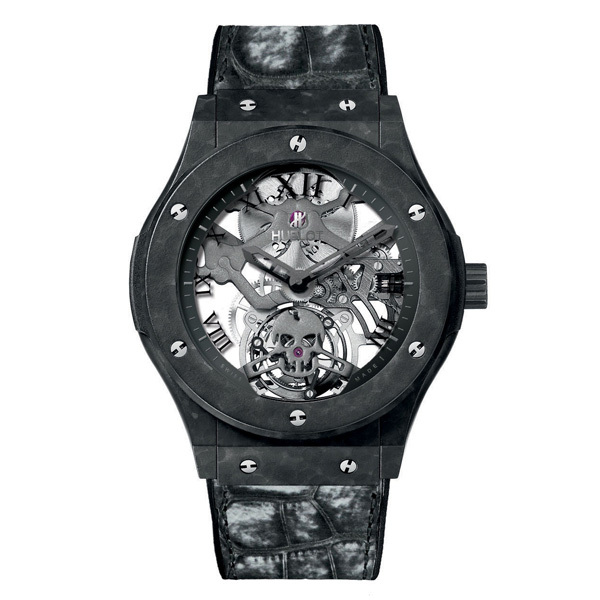 The Manufacture's famous manual winding skeleton tourbillon movement with its 5-day power reserve – entirely designed, developed and manufactured in the workshops at the Hublot Manufacture – has also seen several transformations. This is particularly true of its bridges and plate which have undergone 3-D machining: a laser machining phase has transformed the flat bridges, creating a relief on these components. A very delicate technique to perform, it creates a 3-D look which is also quite rare in watchmaking as, generally speaking, bridges are flat. The components' white surface treatment is obtained through an electroplating process. The components are rhodium-plated then, to achieve this white appearance (instead of retaining their metallic colour), the decoration stage is carried out using micro-blasting which turns them white. 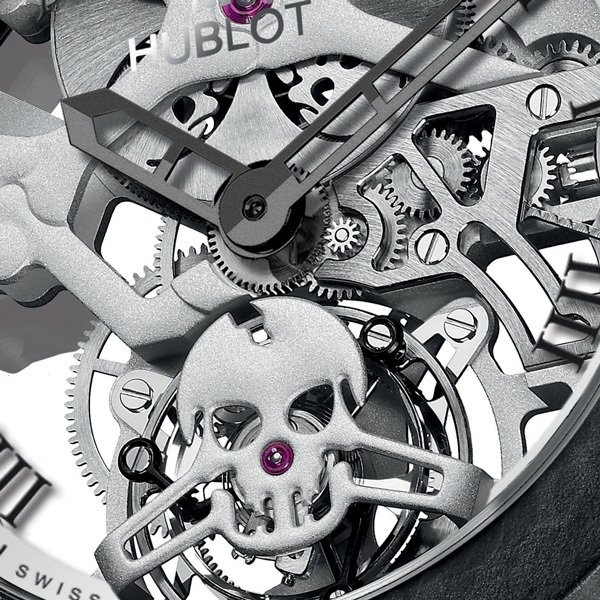 Their bone-shaped design with skull-shaped minute tourbillon barret (which rotates fully in one minute) creates a surprising and different piece: the perfect fusion of the traditional and the modern, the craftsmanship of the past and a 21st-century creative vision for watchmaking. 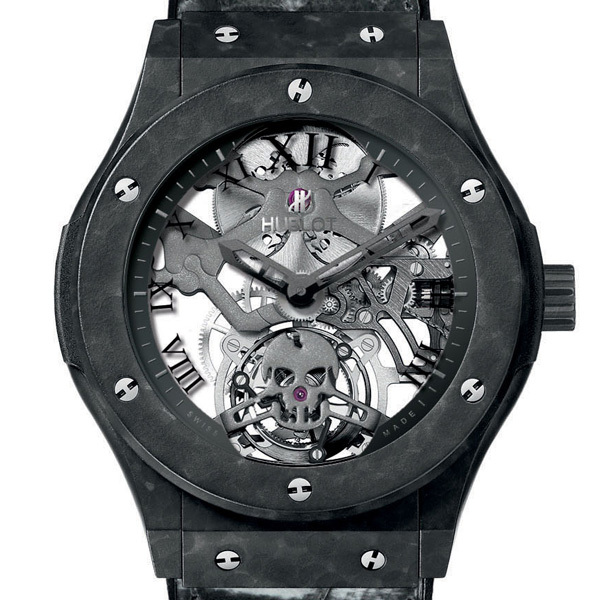 One last small detail adds further interest to the piece, if that were needed: the indices are in Roman numerals, which is also a first for Hublot.